Product information "Irish Linen Shoestring Pocket Square - White / Sky Blue - 43 x 43cm"
White Irish Linen pocket square with sky blue shoestring border. An exquisite classic, beautiful, simple and elegant. Works in a wide range of outfits, here are examples of one classic ensemble: navy suit, white shirt, burgundy printed tie, brown boxcloth braces, dark brown oxfords; and a more casual one: blue jacket, white/blue striped shirt, burgundy repp tie, striped barathea braces, tassel loafers. Irish Linen is a codename for the highest quality of linen: the long history this island has with the production and weaving of linen has made them masters of this beautiful fabric. By nature, linen is stiff; Irish Linen adds a buttery softness to this without compromising its inherently formal nature. This combination of opposites is what makes this fabric truly special. The breast pocket is the perfect place to showcase these gorgeous qualities: whether in a sharp TV fold or a less structured pointed fold: combined with the meticulously hand-stitched edges, these pocket squares are the embodiment of refined style. No outfit is really complete without a pocket square. These here are especially easy to coordinate: classic white linen with colored edge (hand-rolled, of course). For linen pocket squares we recommend a rectangular fold: just fold the square in half three times and put it in your pocket so that about 1cm shows. If you like it really crisp you can iron the folded square (omitting the edges, obviously). 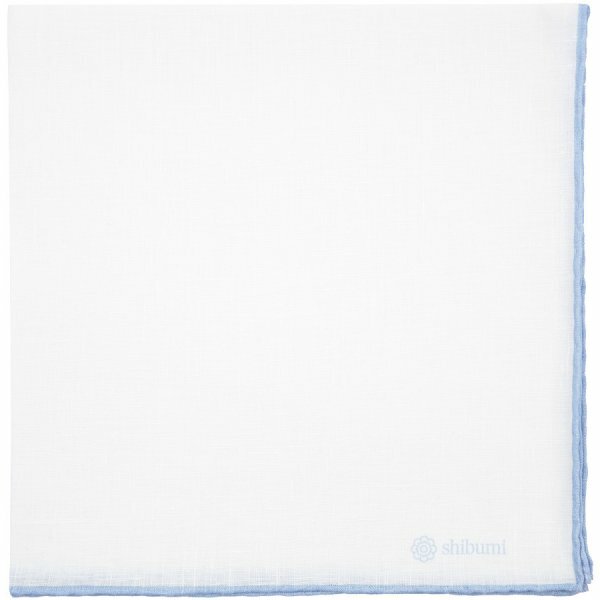 Related links to "Irish Linen Shoestring Pocket Square - White / Sky Blue - 43 x 43cm"